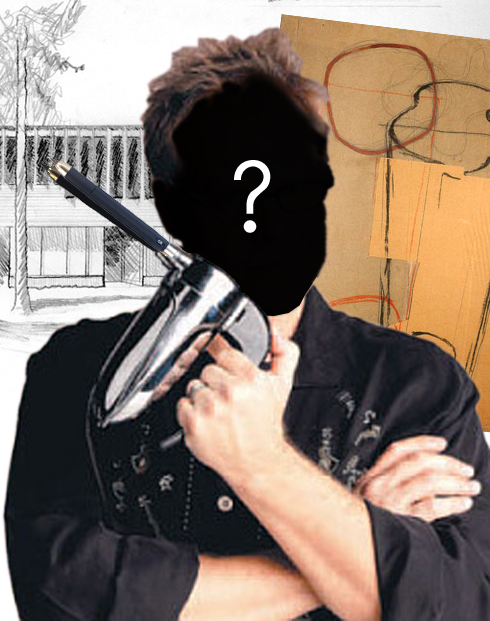 It’s time for another volume of Guess This Fake Architect! There’s a link to all the others just below if you feel like catching up. And remember, save the underlined citations for last if you don’t want to spoil the surprise. This fake architect is a Scandinavian architect and TV personality. Born in Finland in 1962, this fake architect found himself dissatisfied with the typical format of the architecture TV show. He obtained a degree in architecture specifically to address this deficiency. In 1998 he debuted the TV show that he may be most famous for, Good Deets, in which he not only explains how to draw good architectural details, but also explains the science behind them. A typical episode of Good Deets references a popular film in the title, and shows how to draw a few variations on an architectural theme. For example, The Wood, The Bad, and the Ugly, A Block to Remember, The Rocky Mortar Picture Show and Brick Tracy show innovative detailing for wood, brick, brick and brick respectively. During Good Deets’ 12-year run, this fake architect also produced a miniseries called Feasting on Aäsfült, in which he traveled the Scandinavian countryside visiting famous saunas. The series was shot as a road trip documentary, leaving the set kitchen behind and featuring the entire lean crew on their snowmobiles. This fake architect is now the host of Iron Architect America, which pits up-and-coming architects against established professionals in a battle to use a “mystery material” to the greatest effect. Each season’s winner is awarded the medal that bears this fake architect’s name, considered one of architecture’s highest prizes. As always, leave suggestions for any future fake architects in the comments, tweet them to me, or post them on facebook. This entry was posted in Features, GTFA. Bookmark the permalink.